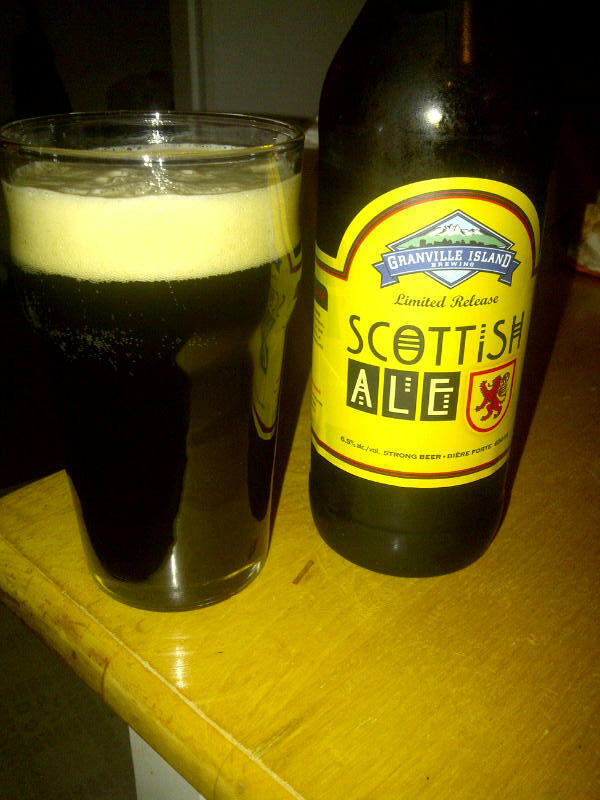 From Vancouver’s Granville Island Brewing comes their “Scottish Ale”. This Ale pours a deep chestnut brown with a brownish head. The aroma consists of lots of malts with a good caramel presence as well. The flavour is dominated by malts with a good hit of caramel as well as some mild hops and a good sweetness. The alcohol content of this Scottish Ale is 6.5% and the IBU is 20. This is a very sessionable ale even if it is slightly stronger than most sessionable beer. Commercial Description: This full-bodied ale is as bold as the lochs, hills and coastline that inspired it. Chestnut brown in colour, it is definitively malt forward, with layers of big roasted and malted barley flavours. Food Pairing as per Granville Island Brewing: Roasted and caramel malts pair perfectly with grilled, braised or roasted meats. This entry was posted in Scottish Ale and tagged bc, beer, canada, caramel, granville island, granville island brewing, hopy, malt, malts, malty, mild hops, sweet, sweetness, vancouver.